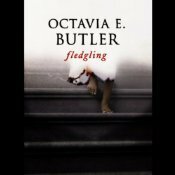 What It’s About: Fledgling, the late Octavia E. Butler’s final novel, is the story of a young amnesiac girl whose alarmingly inhuman needs and abilities lead her to a startling conclusion: she is in fact a genetically modified 53-year-old vampire. Forced to discover what she can about her stolen former life, she must learn who wanted to destroy her and those she cares for, and how she can save herself. Fledgling is a captivating novel that tests the limits of “otherness” and questions what it means to be truly human. What I Thought: Why did it take me so long to read Octavia Butler? I’ve had Fledgling for a while, and figured it was a good time to actually read it. I really liked it, and I think I’m going to read Kindred sometime soon. Butler certainly created an interesting vampire myth with Fledging, and the humans needed the Ina (Butler’s vampires) as much as the Ina needed their humans. I thought Shori was an interesting (but also compelling) character- she’s human and Ina, attacked, and left with no memories. I can’t imagine what she had to go through and what it was like for her to remember nothing. Leigh was a wonderful narrator for the book- in my mind, she was Shori. While I liked her as a narrator, I’m not sure if I like her enough to seek out anything else she’s narrated. But if I happen to come across a book she’s narrated, I wouldn’t hesitate to listen. I sort of wish I had reviewed Fledging right after finishing it, because I’ve forgotten a lot of what I wanted to say between when I finished the book and now. My Rating: 4 stars. I really liked it, and Butler really drew me into Shori’s world. What It’s About: Henrietta Lacks, as HeLa, is known to present-day scientists for her cells from cervical cancer. She was a poor Southern tobacco farmer who worked the same land as her slave ancestors, yet her cells were taken without her knowledge and still live decades after her death. Cells descended from her may weigh more than 50M metric tons. What I Thought: I am so glad I read this book! I don’t know where to start with Immortal Life, because there were a lot of interesting things in it. I think what made her story so fascinating was that they took her cells without asking. I mean, it’s not surprising, given the time period (not that I’m trying to assume anything, because assuming isn’t good) but it’s hard to believe. Her own family has trouble getting good healthcare, and I really felt for them, especially her one daughter, who wanted to know more about her mother. Immortal Life is really two stories- HeLa cells, which are very really important in the science world. A lot of advancements made seem to be based on the cells they took from Lacks. The other story is of Lacks herself (only a little) but it focuses more on her family and how what happened to Lacks had such a huge effect on them. Not only that, but I was horrified by how Lacks name was attached to the cells, and that her name was attached to her medical records…and that they just randomly handed it off to people. I work in medical records for my day job, and I kept having to remind myself that this was way before HIPAA and that there weren’t federal privacy laws. At least some states had them, but unfortunately, Maryland wasn’t one of those states. That has since changed, but I was so taken aback by that. And the fact that they didn’t even have the right name! I can’t help but wonder so many things. Like, how would things have been different if they did get informed consent. Was her race or socioeconomic status a factor? And she is definitely a real person, which the researchers seemed to forget. It did seem like they saw her as just cells, and it also felt a little bit like that with her family too. I don’t blame her family at all for wanting their mother to be recognized for her huge contribution to science. It’s such a balanced look, and you see so many different pieces of the story. It’s definitely a non-linear story, and Skloot herself does appear in the book. But it’s only when it’s absolutely necessary, and I can’t imagine the story being told in a linear way. I feel like it’s so hard to do this book justice, but it’s such an amazing look at the ethics of research and consent and trying to find the truth. My Rating: 5 stars. It’s an awesome book, and if you haven’t read it, you really need to. I also read The Immortal Life Of Henrietta Lacks by Rebecca Skloot and you are right that it’s well deserving of 5 stars!! It really is! It’s a fantastic book, and deserves a lot more recognition! The Immortal Life of Henrietta Lacks is one of the top books in my list of creative non-fiction, right up there with Tracy Kidder’s books, all of them. I haven’t heard of Tracy Kidder, but I’ll have to check them out. I don’t read enough creative non-fiction.